International soccer star Henrikh Mkhitaryan, who signed a new three-year contract with Arsenal on Monday, said he wants to donate his Manchester United jersey to charity in Armenia that deals with children with cancer. “To thank the #mufc fans and on behalf of all those who contributed to the ‘Micki’ documentary, I’ll donate a ManUtd jersey signed by all the players to help cancer affected kids in Armenia,” Mkhitaryan said on his official Facebook page. Meanwhile, on Tuesday Mkhitaryan headed for his first practice with his new team and showed off his new jersey bearing the number 7. “It’s a dream come true because I’ve always dreamed of playing for Arsenal. 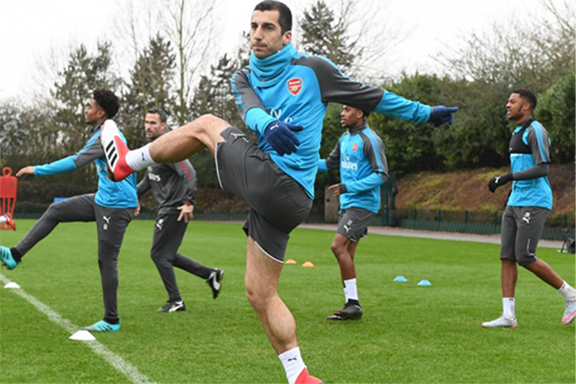 Now that I’m here, I’ll do my best for this club to create history,” Mkhitaryan said after finalizing his contract with Arsenal.